My big grammer pet-peeve is using “good” instead if “well”. “I’m doog good.” “I’m doing well.” Grrr…. It’s actually more appropriate to say you’re good in that situation. Something that always confuses me is where to put the punctuation when you’re using quotes while talking about a word, such as “you’re”. Like that right there. It doesn’t make sense to me to write “you’re.” However, it makes perfect sense to me to use punctuation inside the quotes when quoting a person, like when quoting someone who said “I farted.” I guess it feels like it the punctuation is separate from the word/quote in the former scenario, but part of the quote in the latter scenario. If someone can explain this to me I’d greatly appreciate it! There was a low, flubbering sound, followed by an extremely evil smell. Everyone turned accusingly to Danielle. Flustered, she exclaimed “it wasn’t me!”. Quote punctuation goes within the quotes, sentence punctuation goes outside the quotes. Well technically the period should be after the quotation marks as you’re completing your sentence not the word’s sentence. 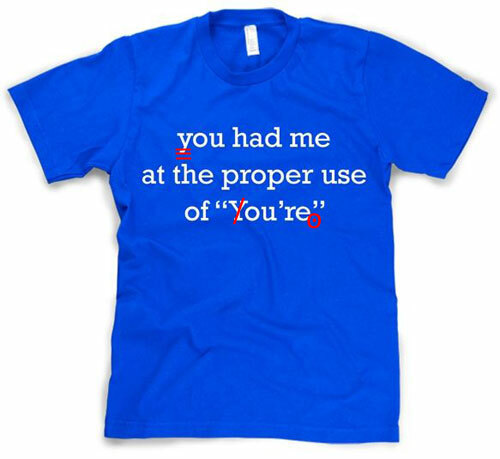 That being said I support the idea of the shirt WITH the red marks. Gasp! My whole belief system is thwarted! Trust me, Julia — I think the Euro rules make SO much more sense on this, but our beloved Pintester is right. Sad, no? I can’t say I approve, but the law is the law. Eh? Really? I’m sticking to my British English on that one, then, thanks! As a 10th grade English teacher, I love this.